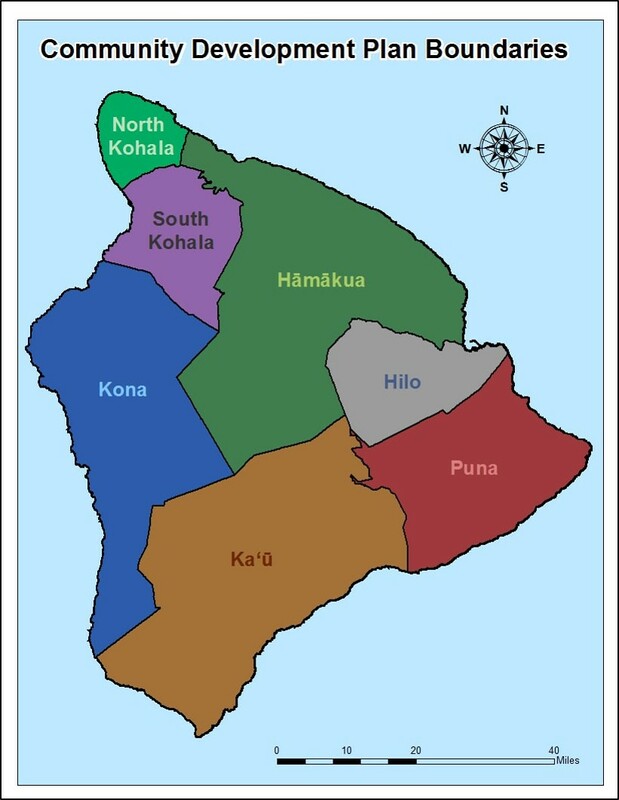 The current Hawai'i County General Plan, approved in 2005 by the County Council, is the overall planning document for Hawai'i Island. The General Plan outlines the process for adopting Community Development Plans (CDPs) outlined in Chapter 15.1: Community Development Plans. CDPs are enabled by Hawai'i County Code Section 16-2 and administered by the Planning Department. They serve as the forum for community input into establishing County policy at the regional level and coordinating the delivery of County services to the community. They translate the broad General Plan statements into actions as they apply to specific geographical areas. The CDPs direct physical development and public improvements and may contain detailed land use and zoning guide maps, plans for roadways, parks, other infrastructure and public facilities, planning for watersheds and natural resources, and any other land use matters relating to the planning area.